The New York Times has released a major upgrade to its NYTimes iPhone app. The news organization has brought over the expanded content and breaking news alerts that its iPad app gained last December, but notably missing is any mention of the upcoming digital subscription features that will launch next week. NYTimes 3.0 for iPhone and iPod touch has gained access to the same expanded content of the iPad version, which includes more than 25 different sections from the Times’s Website, including Business Day, Books, Dining & Wine, obituaries, and all of the publication’s blogs. The app also now supports video and photo slideshows embedded in articles or accessed from the dedicated sections tab. A revamped Favorites section lets you save any section, blog, or article for easy access. Individual articles get their own space in the Favorites tab for reading later. For breaking news junkies, NYTimes 3.0 also now supports Push Notifications, though you cannot customize which sections you receive alerts for; it’s an all-or-nothing switch in the app’s preferences. Finally, this update also includes swipe gestures for easily moving between articles on an iPhone 4 (why the app only supports this feature on the latest iPhone, but not the latest iPod touch, is unclear). The app’s description in the App Store still includes the same long-running disclaimer that it will be “free until early 2011,” with no mention of the Times’s new, digital subscriptions that go in effect on Monday, March 28. If you want to use the Times’s iPad app, the price rises to $240 per year but does not include access via the iPhone app. If you want to read The New York Times via all of your supported devices, the price leaps to a whopping $455 per year. But a loophole provides the same level of access if you’re willing to sign up for weekday delivery of the print version of The New York Times at $385 per year (not including the Times’s discounted introductory rate)—that’s nearly $100 cheaper than the digital-only subscription. All print subscribers, regardless of edition, get full digital subscriptions for free. 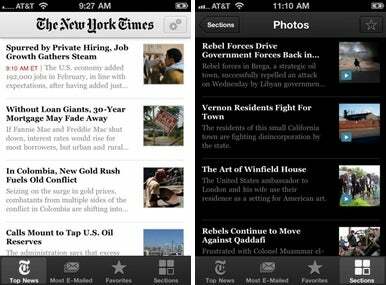 NYTimes 3.0 is available now for any iPhone or iPod touch running iOS 3.0 or later.